Let us go to the Convento dei Pavoniani in Lonigo, Venezia, where in August and September 2012 I1 Pomo d’Oro under Riccardo Minasi is accompanying the Spanish countertenor Xavier Sabata for a CD of Handel arias, then let us go to the Villa San Fermo in Lonigo, Venezia, during the same week, where Il Pomo d’Oro under Riccardo Minasi is accompanying the countertenor Max Emanuel Cencic in a CD of arias by Vivaldi and others… The producer is the same; the discs are released at the same time on different labels. 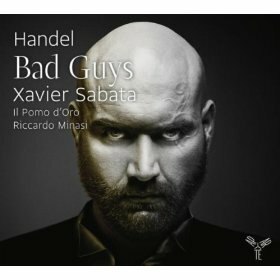 The Handel selection bears the title ‘Bad Guys’ and a cover photo which shows Sabata glowering with assumed evil intent. He delivers 12 arias from six operas, of which only the two from Ottone are together (the three Ariodante excerpts are scattered to tracks 2, 5 and 11). At 53 minutes the duration is mean. Envy, revenge and desire for power are the driving forces behind these villains. The first aria is the one from Tamerlano (there was room for others), in which he wishes to ‘bring peace to a haughty spirit’. There is no angry outburst, no dramatic bravura vehemence but a lovely aria, in which Sabata’s voice sounds warmer, with a lower centre of gravity, as it were, than Cencic’s, but we now need to hear music more flamboyant. Sabata’s rounded tones are confirmed in Polinesso’s ‘Spero, per voi’ on track 2: think of a contralto countertenor. ‘Spero, per voi’ is a love song, but Polinesso’s third aria, ‘Dover, giustizia, amor’, is of a more fond cast, of a desire for glory, and Sabata is smooth in his agility, while in the remaining extract from Ariodante, ‘Se l’inganno sortisce felice’, he opens his vocal paintbox wider. In Amadigi di Gaula, Dardano, Prince of Thrace, loves Oriana, who prefers Amadigi. To show that the ‘bad goys’ are not constantly spitting vitriol, Handel gives Dardano the saraband ‘Pena tiranna’, ‘thus proving that revenge can spare no one the sufferings of unrequited love’ (Gabrielle Oliveira Guyon’s note). Sabata supplies the doleful tone; it would have been even better had the producer made the orchestra less insistent. Earlier in the opera, Dardano seeks the help of the witch Melissa to win Oriana and in ‘Agitato il cor mi sento’ (not a Metastasian ship being buffeted by storms and rough seas) he has to sing a more flowery tune, which finds Sabata fully capable. These two arias are eight tracks apart. Adalberto plans to usurp the throne and to steal from Ottone the latter’s beloved Teofane. In ‘D’inalzar j flutti al ciel’, Sabata’s tone is at its most succulent: warm and rich. It is one of those cases in which the voice suits the music and the music suits the voice, and again one hears a pleasing melody, such as might be for a hero rather than a villain, a description that also applies to the slow ‘Bel labbro, formato’, and how smoothly Sabata’s voice undulates. Many will propose Giulio Cesare as Handel’s finest opera: it must be on the short list or in the play-offs. So many glorious arias are contained therein that those for Tolomeo tend to be overlooked. Two examples are included in this recital, the first, ‘Belle dee di questo core’, the shortest here, being an attempt to win Cornelia’s favours (of course, it does not help his cause that he murdered her husband). As sung in the focused tone of Sabata, it deserved to be twice its l’50”. No thinness infiltrates this resonant sound. We are left with the two choices from Teseo, the earliest opera represented: 1713. King Egeo and his son Teseo love the same woman, Agilea. Whereas Dardano sought the assistance of Melissa, Egeo turns to the infamous Medea, who is in love with Teseo. Sabata deals deftly with the little flourishes and curlicues in ‘Serenatevi, o luci belle!’, which, with the orchestra not overreaching, is well recorded. This programme has included some arias demanding agility but nothing that reaches the brilliance that Cencic shows in various selections, but I have one piece remaining (actually on track 3 Egeo’s rage venting ‘Voglio stragi, e voglio morte’ (‘I want slaughter and I want death’) Fast and furious, it carries Sabata higher than elsewhere (no strain) and shows no hitch in his rapid emission of notes. 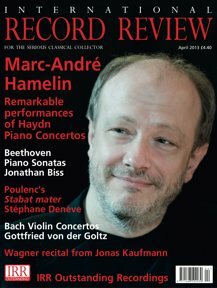 I am pleased to make the acquaintance of another impressive countertenor. Minasi leads an accomplished group, as adroit in its playing as Sabata is in his singing.